The mottled spots giraffes are known for aren't random, according to a new study that suggests the patterns are inherited maternally — and that they may impact the chances of a calf surviving its first few months of life. The study has produced the first data of its kind. Scientists have previously hypothesized that variation in spot patterns may camouflage newborns against predators, and that the animals' spots are conferred at random. 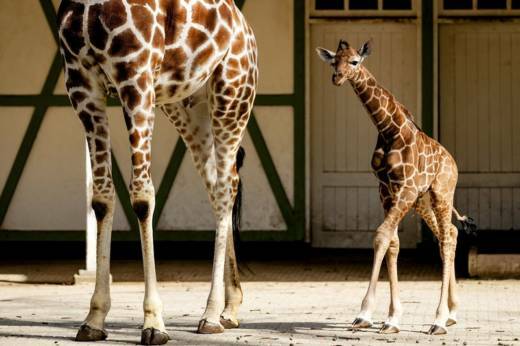 One prominent biologist, Anne Dagg, described similarities between parents and offspring in a zoo population in 1968, but analysis and objective measurements of spot characteristics were lacking in wild giraffes until now. Lee and his team conducted their study by using image analysis software to determine the similarity of spot traits between wild Masai mother giraffes and their offspring in Tanzania, where the animals exist free and unfenced across vast landscapes. Over the course of four years, the scientists photographed the coats of 31 sets of mother-calf pairs. They found that some characteristics, like roundness and smoothness, were strongly linked between mother and offspring, and likely to be heritable. Lee adds that other variables like good genes and maternal investment may also be correlated with spot traits. "Other alternative functions of the spots also could be under natural selection at different periods in a giraffe's lifetime such as temperature regulation or visual signalling to identify individuals and kin," he said.